The first contest is a CAGE DECORATING CONTEST! There will be two hidden forums created on The Sweet Spot - one for Texas attendees and one for those attending in Florida. Once you register for the event, you will be given access to the one hidden forum for the venue you are attending (so, if you are attending in Texas, you will see the Texas forum but will not be able to see discussions in the Florida forum). The challenge is for all attendees to work together before the event to plan the perfect cage set up. The possibilities are endless!!! But, the rule is that each item placed in the cage must be donated by one of the attendees for that venue. You must use these months to plan and prepare and discuss and debate amongst yourselves. Then, on Friday night (March 11) after dinner, each state will be given ONE HOUR to decorate your cage. The cages will then be displayed for those participating from home. The online participants will be given instructions for voting on Saturday and will vote for the cage they think is best. The winning venue will be announced before the end of the event on Saturday. These cages will then be offered in a very special raffle. So, put forth your best effort, as someone (well, two someones) will be going home with a new, fully decked out cage!!! Val will not be participating in this event as she is the only person who will be able to see both hidden forums. Val has offered to make one product from her store for each venue. All you have to do is ask. 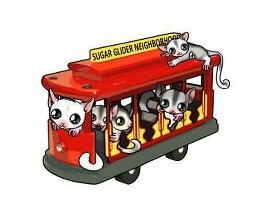 All other SUGAR Group members can participate in the cage decorating contest, but are not eligible to win the cage in the raffle. Good luck everyone! Get those registrations in so that you can begin planning your cages!!!! The Texas crew is already getting a good start on the cage decorating contest! Not sure how the Florida crew is coming since I'm going to Texas. We've got our own private areas on TSS http://thesweetspot.forumotion.net/ so we can discuss ideas and stuff without the other side seeing. I cannot believe how close this is getting! Let's see some more registrations! Don't forget you can be a part of this awesome experience from home, too! The next 5 people to register to attend the RRRoundup at each location will receive a free gift at the event! This is for the next 5 to register to attend in Texas, the next 5 to register to attend in Florida AND the next 5 to register to view online (15 gifts total)! So, if you have been waiting to register, now is the time to do so!! !